Andrew Lownie Literary Agency :: Book :: Nobody’s Son. He settles easily and is very much looking forward to having a forever family of his own. The introductions and move to his adoptive family go well. But Alex is only with them for a week when problems begin. What happens next is both shocking and upsetting, and calls into question the whole adoption process. It’s not the first time this has happened and it won’t be the last. "Amazing book, I was filled with emotion for this lost little boy. . Brilliant. Never disappoints Another excellent book by Cathy Glass. I couldn’t put it down Amazing book I read it in one sitting"
"So beautifully written my heart ached for Alex. Another amazing read! Poignant and touching Another excellent book by my favourite author Fantastically well written "
"A very good book that calls into question the workings of our adoption system. Another great book "
"A poignant and stirring glimpse into the life of foster care." "An excellent book, wonderfully written." Cathy Glass’s Nobody’s Son has retained its Number 18 place in the charts this week. 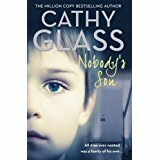 Congratulations to Cathy Glass whose Nobody’s Son remains at Number 18 in the Sunday Times bestsellers this week. Cathy Glass’s Nobody’s Son is at Number 18 in the paperback non-fiction bestsellers this week. It has been in the bestseller list continuously since 1st March spending the first two weeks at no 1. Cathy Glass’s Nobody’s Son remains in the bestseller list for another week - this time at no 13. Cathy Glass’s Nobody’s Son is at Number 12 in the Sunday Times Bestsellers this week . Cathy Glass’s Nobody’s Son remains in the paperback non-fiction list for a sixth week - this time at no 13. Congratulations to Cathy Glass whose fostering memoir Nobody’s Son remains in the top ten paperback non-fiction list for a fifth week - this week no 9. Nobody’s Son by Cathy Glass remains in the Top 10 Sunday Times bestseller non-fiction paperback list at Number 6 . Congratulations to Cathy Glass whose latest fostering memoir Nobody’s Son remains at Number One in the Sunday Times non-fiction paperback bestseller list for a second week. Congratulations to Cathy Glass whose latest fostering memoir Nobody’s Son has gone straight to Number 1 in the Sunday Times Paperback Bestsellers this week.